One important part of the Ubuntu Accomplishments design is that any project or community can provide accomplishments. From the beginning I have been building the Ubuntu Community Accomplishments set to demo the system, but I am keen to encourage other projects to do so, such as upstreams, distributions, and other communities. 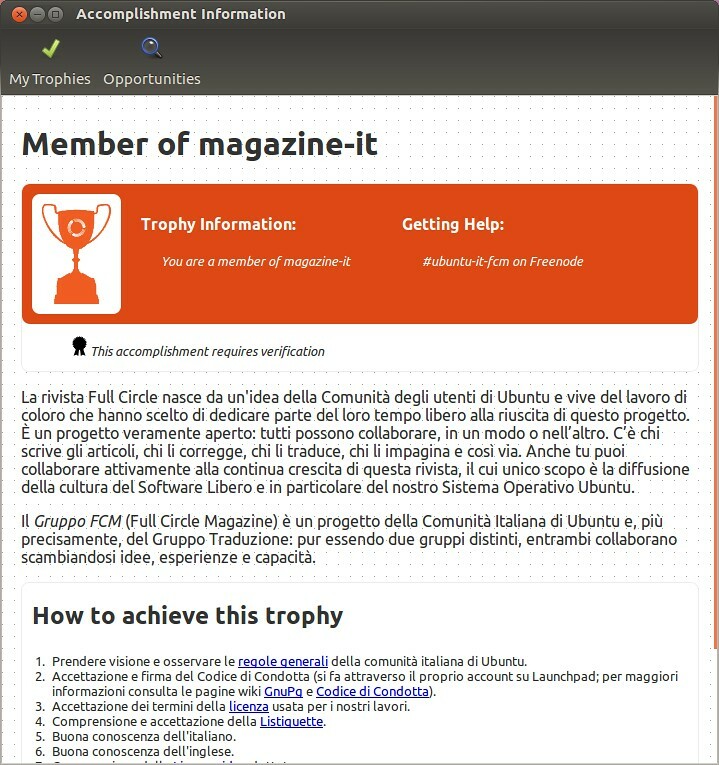 Recently Alessandro Losavio from the Italian Ubuntu community proposed an accomplishment related to the Italian community. 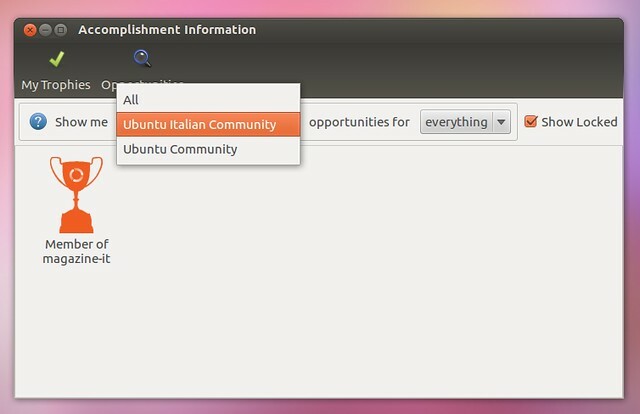 With the accomplishment likely only being of interest to Italian speakers (as opposed to the general global Ubuntu commmunity, for which the Ubuntu Community Accomplishments set I referred to earlier are intended), I recommended that Alessandro create an accomplishments set specifically for Italian Ubuntu users. Obviously, some of the English headings would sugges that we have some in-app translations to add. I plan on looking into this soon. Thanks Alessandro, and I hope we see some more awesome accomplishments joining the Ubuntu Italian accomplishments set in the coming weeks! If you would like to contribute an accomplishment to either Alessandro’s set or the general Ubuntu Community Accomplishments, be sure to see this documentation, and if you would like to create your own accomplishment set for your community, see these docs too. Thanks! Oh, and I did an interview for the Ubuntu UK Podcast about Ubuntu Accomplishments. Listen to it here. i read your awesome stuff its great …. and your project is seems great…!